There's something to be said for toeing the line with some of the best athletes in the world. Two years ago at Worlds I was so nervous I felt like I couldn’t breathe or move a muscle, but this year was different. After spending a winter over in Europe and competing in a couple of World Cups, I came back to Europe with a level head and ready to do work. Last year I was lucky enough to race the Vertical and Individual courses for this year’s Worlds. My trip to Worlds started off a bit unplanned. My flight was cancelled and I received a ride from three lovely gentlemen from Jackson to Salt Lake City. I was supposed to arrive two days before my first competition, but instead I got in the day before and within 24 hours was on the course of the Vertical race. Standing on the starting line I was calm and focused. I knew what to expect and just needed to hang on. In years past I was never very fond of the Vertical but this race changed my opinion. I enjoyed every minute of it. With the crowds of people cheering and the level of competition surrounding me-- it was perfect. I was able to shave 6 minutes off my time from the previous year and placed 25th. The Individual Race followed two days later and what a ride that was. For much of the course I shared my experience with fellow teammate Sarah Cookler. I think the two of us having each other there pushed us more than any other person. The course was around 4,000' with steep, technique decants. At the finish line Sarah and I were only separated by one second! Both Sarah and I finished five minutes behind our top American, Lyndsey Plant. It was the first time on both the men’s and women’s side that all four ladies scored points for Team USA! The Teams Race did not disappoint with a beautiful 6,000' course circling Mont Gele a couple times. My partner McKenna Douglass and I had a spectacular time and very few issues. The first ascent was icy and bumped out. With a very short decent the second ascent presented a very long booter. Up couloirs and ridges we made our way through the course with the last descent being close to 4,000'. We just missed out on a 10th place finish, but both of us were pleased with our effort for 11th. The last race of the week was the Teams Sprint. After racing three races and being jet lagged, I was far from being fresh but toed the line to lead off our team. I kept a 40 second gap to Canada’s Melanie Bernier. The course is fast but leaves nothing out. In total there are four transitions, two skinners, two descents, one booter and a skate ski to the finish! The team order was, I lead off, Sarah Cookler was 2nd and our anchor was Jessie Young. With my start Sarah closed the gap on Canada and Jessie finished strong with a 5th place. Click here for more skimo pics and videos! Overall I was pleased with my performance. I was able to score points for Team USA in every event and had a blast doing it. Team USA finished with a strong 10th place and all of our hard work and improvements had shown. What an amazing experience filled with wonderful teammates and competitors. I look forward to the next Worlds !!!!!!!! Bottom Line: Wear sunscreen. Every time out. Most of us live at altitude and play at an even higher altitude. There's every reason in the world to use it, and no reason not to use it. Based on our tests I've switched my regimen to use Beyond Coastal Active SPF 34. If it's going to be especially hot, I'll add the Neutrogena Ultra Dry to my face because of its sweat-related properties. What pole length should I use for skimo racing? This is a question we've all asked. And if you're like me you've received every answer under the sun. Recently, preferred pole length has been getting shorter. Whether that's because of any quantifiable benefit or because that's what seems to be in vogue right now, who knows? The easiest way to determine your ideal pole length is to tour and train with adjustable length poles, paying close attention to where you feel most comfortable. Experiment with different lengths on different terrain. See what does and doesn't work for you. 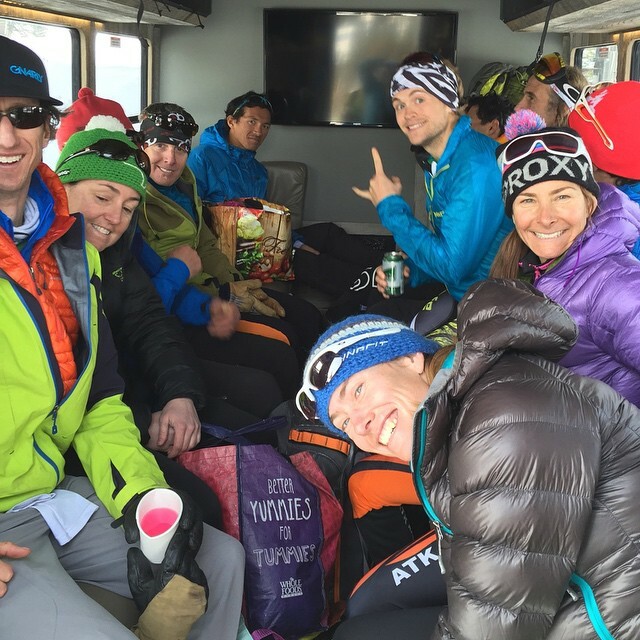 The length you arrive at is probably the length you'll want for skimo racing. Below are some formulas that people use, with varying levels of success, to determine their pole length. Consider this a great starting point for your experimentation. EXAMPLE: 5'10" (178cm X .55)+38 = 136cm MPL Start at 136cm and work your way down. A convenient way to calculate your skimo pole starting point, especially for those coming to the sport from the Nordic side, is to use a Nordic pole chart for classic skiing and subtract 12-15 cm. Below is the Swix Classic Pole length chart based on user height. Thanks to Pete Swenson, Stano & Skintrack.com for help with this article.